The Commission had informed all candidates that both the facilities i.e. One-Time Registration and filling of online Application Forms would be resumed on the Commission’s website w.e.f. 17.08.2018 at 10 AM and the last date for receipt of applications would be 30.09.2018 at 5 PM. This position is maintained by the Commission. Any applicant, who wishes to apply for the said examination may register themselves on the website of the Commission w.e.f. 14.08.2018 and submit online application after 17.08.2018. It is reiterated that last date for submission of online applications would be 30.09.2018 (5 PM). 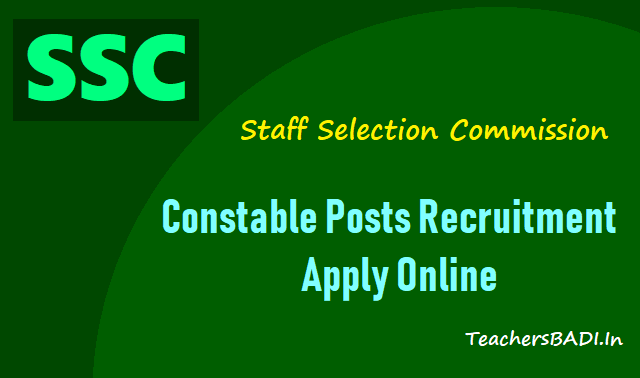 Staff Selection Commission (SSC) has begun the application process for Constable GD posts today. The commission had begun the one time registration process on August 14, 2018 for the benefit of candidates, however, application submission was not allowed. Candidates will be able to register and complete the application process starting from August 17. This is the second time the Staff Selection Commission (SSC) will start the registration process for 54,953 vacancies for the Constable (GD) in CAPFs, NIA, SSF and Rifleman (GD) in Assam Rifles Examination, 2018. The first registration was held in July. However, then, due to heavy load of applications, the Commission had to withdraw the application portal link. The application portal link will be active till September 30, 2018. To avoid the situation which was created earlier, the commission has also advised candidates to register and complete their application process in off-times. "As the new website of the Commission may take some time to stabilize, for initial few days, to minimize the inconvenience to candidates, applicants are advised to also utilize off-time or non-peak hours of 10 PM to 8 AM for making One-Time Registration and filling of online Application Forms," reads the notice on SSC website. To apply for SSC Constable GD, eligible candidates would first need to complete a one-time registration on the website. This will generate a registration id and password. Candidates would need to login again using the generated login credentials and apply for the post using the specific link provided. Staff Selection Commission (SSC) invites applications for the recruitment of Constable(GD) posts in CAPFs, NIA & SSF and Rifleman (GD) in AR Examination 2018. Age Limit (as on 01.01.2018): 18 to 23 years. Candidates age limit should be between 18 – 23 years for Constables as on 01-07-2018. Relaxation of age will be applicable up to 05 years for SC/ ST candidates and 03 years for OBC candidates & other relaxation details refer the notification. Based on Computer Based Exam, Physical Efficiency Test, Physical Standard Test, Medical Examination, Document verification. Last date to apply: 30.09.2018. Last date for payment of fee: 30.09.2018. 1. Before applying online candidates should have valid e mail & scanned copies of photograph, signature.